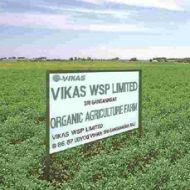 Vikas WSP is currently trading at Rs. 14.19, up by 0.77 points or 5.74% from its previous closing of Rs. 13.42 on the BSE.The scrip opened at Rs. 14.00 and has touched a high and low of Rs. 14.44 and Rs. 14.00 respectively. So far 333564 shares were traded on the counter. The BSE group 'X' stock of face value Rs. 1 has touched a 52 week high of Rs. 18.10 on 05-Jan-2018 and a 52 week low of Rs. 9.80 on 11-Aug-2017.Last one week high and low of the scrip stood at Rs. 14.44 and Rs. 12.61 respectively. The current market cap of the company is Rs. 274.16 crore. The promoters holding in the company stood at 18.78%, while Institutions and Non-Institutions held 0.44% and 80.78% respectively.Vikas WSP has received orders for Rs 219.36 crore Thermogel-3O guar gum and DP-100 guar gum for yoghurt, dairy, milk, health care applications. The company received these orders from its customers globally. These orders would be executed within August and September 2018.